Looking for a new home or property? Do you have a property you need to sell? Let Crossroads Realty assist with all your real estate needs! With 2 offices and 12 agents, we bring a wealth of experiance to the table and can help make buying or selling a home easy. 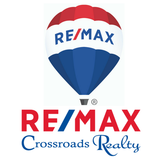 RE/MAX Crossroads Realty is dedicated to serving our buyers and sellers. Our goal is to listen and find your needs and wants in a property while we take the time to form a lasting relationship with our clients.